Our moisture resistant, plastic coated corrugated boxes interlock to stack ten high, each supporting up to 500 lbs of over-head cassettes and slide weight. 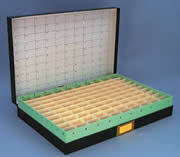 Each box holds 2000 slides or 500 tissue blocks or 1,000 35mm slides to meet your varied storage requirements. Overall measurement: 11½" (L) x 12"(W) x 4"(D) (260x305x102mm). The slide storage file has four drawers; the cassette storage file has eight drawers. All of the file cabinets are stackable. Embedment Block Capacity: 100 to 1000 per tissue file. 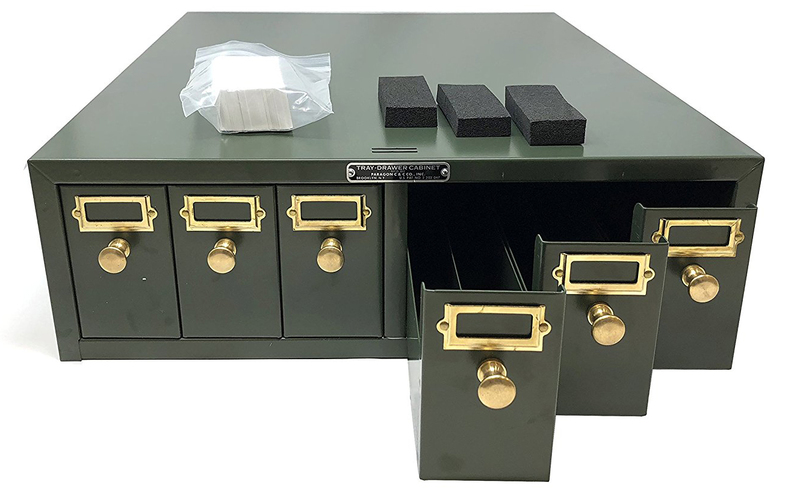 A prepared Microscope Slide Cataloging and Storage System. The slide files contain 48 partitioned compartments which will hold an estimated 10 of 1x3" glass slides per cell (480 slides per case) or 10 of 3x2" slides per cell (240 slides per case) by removing two alternate long partitions. A 3/8" (100mm) cushioning space surrounding the partitioned compartment serves as a protective barrier against damage to the stored slides. For other storage needs, all or alternate partitions are removed for conversion to larger size compartments. Compartment Arrangement: 4 across x 12 deep - Partitions are removable to enlarge each cell. The unit measures: 15¾"(L)x9"(W)x2"(H) (40x23x5cm). Store up to 54,000 slides in only 2 square feet of space. 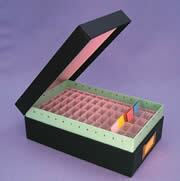 Ideal for use in Pathology, Cytology, Hematology, Histology, Dermatology, Research, Education..
Sturdy - Built to last. 35mm Slide Cabinets interlock with themselves and with Micro-Slide Cabinets, for total flexibility and storage convenience. The depth and width dimensions are the same as (Cat#74780-10) shown above; the height is about 1" (25cm) lower and uses the same base as our (Cat# 74780-10). Please see listings in the Histology Section. For years, the hard plastic jewel case was the only product available for the protection and storage of compact disks (CDs), which are very brittle, easily broken, and too bulky for storage. Now we are able to introduce alternatives: the C-Shell™ and Paper Sleeves. C-Shell™ is designed to provide filling, storage, and protection for compact disks or DVDs during shipping. The C-Shell™ is an ultra slim (only 4.5 mm thick), one-piece polypropylene shell with a living hinge.